Micronational Cartography Society, or MCS, is an organization in charge of micronational mapmaking. The MCS was founded by Erik Mortis and Scott Alexander near the fall of the Union of Apollo States. It was created to design a standardized system of maps, of an accepted quality, to be used by the entire micronational community. Its original members consisted of Shireroth and Hyperborea; shortly after Treesia and The Flying Islands of Jasonia joined the MCS. Mortis and Alexander served as the Society's co-leaders until the Menelmacari Civil War. When the two tried to divide up Menelmacar's land fairly between the two sides, the group run by Archetype23 was outraged that the Society had failed to see things their way, and helped tar the MCS leadership as unfair and incompetent. Annoyed with the effort of defending themselves, the two disbanded the MCS. Many decided that this was not a move that the MCS should have done, and created the "Rebuild our World" project to form a new cartography society. Due to the successes of the discussion of this, Scott and Erik reversed their decision. In the new MCS, while continuing to officially be in control, the two left day-to-day operations to Ryan Caruso and Ardashir Khan. Although there was never an official power transfer, Ryan Caruso became so intimately linked with the Society and its actions that he is now indisputably its leader. Today, the MCS map is copyrighted by Ryan under Massachusets law, enforcing this claim further. Since its humble beginnings with two countries on a single continent, the MCS Map has gone to seven-ish continents and twenty members, and become a chief way in which micronations learn about each other and interact. The Micras Sector (or, MCS Sector) is the name given to the countries that interact through their presence on the map, which many people call Micras. Incidentally, most (but definitely not all) of these nations are also part of the Anglophone Sector. In 2004, Caruso chose to add another continent and a few extra islands to the map in order to add space. 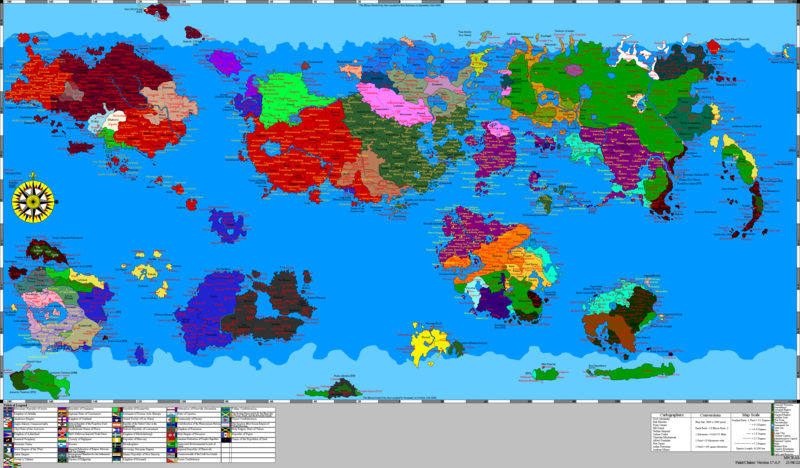 Detractors argued that there was enough space already and that the new landmasses violated the Society's chief policy, that of cartographic consistency. Eventually, Caruso outlasted his opponents, and although not everyone is exactly happy, everyone agrees that for better or worse the new continents are indeed a part of the map. The MCS will grant land to any micronation with at least three citizens and/or showing proof of having an active online community for more than 90 days, but larger countries get proportionally larger land grants. Nations can apply to expand their territory if their fortunes increase, but nations primarily get land from annexing others as colonies. The MCS is very big on cartographic consistency, and these days refuses to add any extra islands or to change the physical layout of the map to suit someone's needs. However, it has relaxed its policy on land swaps, and now allows countries to move places if it would be convenient for them. The MCS tries to avoid countries that are already very large gaining more land. This policy originally applied to Shireroth, but is now in effect with the Grand Commonwealth as well. Ryan is strongly pushing large nations to abandon their land to free up more space for newer countries, and the map is currently in the process of reflecting these changes. This page was last edited on 27 January 2019, at 18:56.